The Class A design 1073 microphone preamplifier features 3 bands of EQ, with one fixed high frequency band, two switchable bands with cut and boost capability, and a high pass filter. All Neve channel amplifiers are designed to accept signals from a wide range of microphone and line sources. The Neve 1073 mic pre and EQ combination adds warmth and depth to recordings, brings out subtle ambience, maintains spatial positioning, and more effectively captures a precise image. 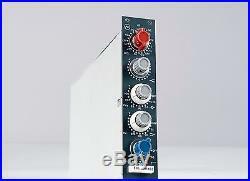 Thats why the 1073 mic preamp is considered by many to be the very essence of the Neve sound. Classic transformer microphone preamp amp (Class A design). Hand-built and hand-wired to original 1970s design. Both inputs are transformer balanced and earth free. Microphone Input: Gain +80db to +20dB in 5dB steps. Line Input: Input impedance 10k ohms, gain +20dB to -10dB in 5dB steps. Output: Maximum output is >+26dBu into 600 ohms. Output is transformer balanced and earth free. Distortion: Not more than 0.07% from 50Hz to 10kHz at +20dBu output. (80kHz bandwidth) into 600 ohms. Freq Response: +/-0.5dB 20Hz to 20kHz, -3dB at 40kHz. The item "Neve 1073 Module" is in sale since Sunday, March 12, 2017. This item is in the category "Musical Instruments & Gear\Pro Audio Equipment\Preamps & Channel Strips". The seller is "thegearlocker" and is located in Miami, Florida. This item can be shipped to United States.